I probably didn't go about this the right way, but I peeled off the gel polish. You are supposed to soak them in acetone for like ten minutes and then file away the residue. They never did chip the entire time I had them on, but they were growing out and starting too look bad. Now, my nails look like I just popped off acrylic. I'm starting to regret ranting and raving about the process. I didn't know they would ruin my nails! Keep soaking them in the acetone. 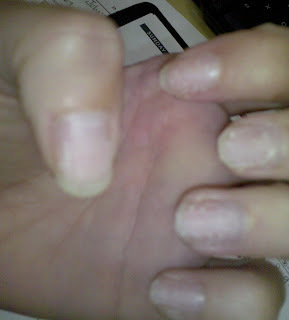 CVS Pharmacy has a great product that removes artificial nails, and will get rid of all that other junk! I too just removed mine last week, and have normal nails again!